Looks like Lindsay’s sitting this one out, after being in the last several; also a tad surprised Keo’s not in the lineup. But with Brandon getting promoted to pro (and Hayley probably on her way there), it looks like they’ve got enough newer pros to give some of the vets a break. As for tour celeb predictions: maybe Tinashe? Or Milo? Who knows…will be interesting to see. Schedule and tickets available here. 10 responses to "PureDWTS Season 27 – Winter Tour Announced"
I check the dates every tour on the off chance that one of these days they will realize there is more to Canada than the GTA (Greater Toronto Area, Ontario). Alas, this is not the time. I’m surprised Sharna isn’t a part of the tour. The shows I’ve been to she was probably the most popular pro there. Is this tour smaller than previous years? I’m surprised there are no West Coast dates (I’m East Coast so that doesn’t matter but still surprising). It just seems it. Judging by the dates, I wonder if that means we are getting a full spring season next year. I hope so. I’d also guess Tinashe and Milo for the celebs. I saw a post on IG that Jensen (Lindsay’s sis) made and she made a comment that she would be getting married in the next 90 days. So I guess that would be in Dec. I bet Lindsay is gonna be helping Jensen get ready for her big day, which is why there is no Lindsay on tour. I too, am surprised about Sharna not being on the tour. The couple of shows I have seen, she has always gotten loud applause after her performance and she can be quite funny when she gets the mic and starts talking. Maybe she wants to go back home to Australia for a while, or has other projects to do outside DWTS. I was gonna add that I guess we will see if Demarcus/Lindsay win the MBT if Lindsay is not on tour. Brandon will be on tour. Hmmm….I would think they would want dance pros that were at least in the finals. 1) Lindsay still as issue with her foot. She got injured on the last tour and she was still treating it a few weeks ago so it’s wiser for her to rest. And yeah her sister’s wedding is also a good reason. 2) IMO @Darlene, tptb choose the celebs for the pros depending on how they do with the viewers since people will be more inclined to go on tour if they like the celeb going too. So yes they will try to get the winning celeb on tour but I don’t think they will rig the entire competition depending on that. I’ve seen one of the DWTS tours and Sharna was like the unofficial hostest with the mostest. Strange that she’s not on the upcoming tour but I hope it means she has really cool things going on. @Philomene Too bad about Lindsay’s foot. I didn’t know she injured it. Best she take it easy and no doubt her sister’s wedding also plays a factor why she isn’t doing the tour. @#nukegrrrl Sharna was great in the couple shows I saw. I have a feeling she will be missed. I would not got as far as call her the “star” of the show, because everyone kind of had equal time on stage. But it was just like she was the standout out of all of them. She definitely has a natural gift of gab. 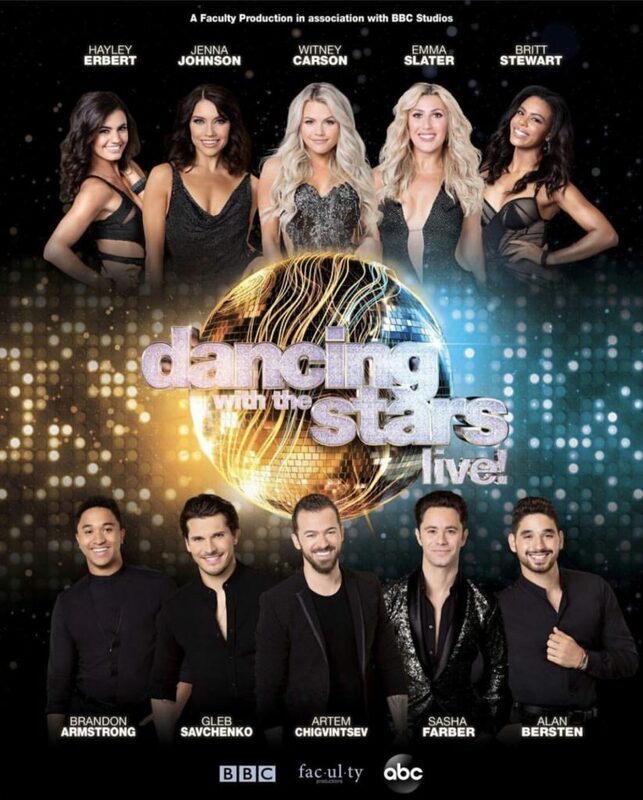 Do you guys think, some dwtsjr cast are going to be on tour? Really sad no Lindsay. Plus there’s Jenna 🤢. With only Witney, Emma and Jenna as current female pros, hopefully we see more of hayley’s routines though. That’s the only good thing. I’m really interested to see How Hayley would do as a pro, I have a good feeling about her, like how I did about Lindsay. Somehow I feel like she’ll be like Emma and Lindsay – the kind of pro that would totally let her partner shine, would choreo well to their strengths, and just overall a really nice, no airs about her sort of person. She seems very down to earth. Not forgetting she’s had what, 8-9 seasons as a troupe member? I’m sure she’s learnt a lot. Hopefully she gets her shot next season! Btw. There was a puke face emoji for the fact that Jenna is in the tour. Somehow it got jumbled up when I posted the comment. Anyway being positive as well, even thought Jenna is going on tour, thankfully Val isn’t, so we won’t end up getting those two shoved down our throats constantly. Hooray!